Pink eyeshadow never looked so good! 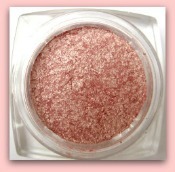 Gold flecked vintage rose Loreal eyeshadow is on my list of best eyeshadow picks! L’Oreal is a makeup company that I am a little new to. While I have heard about them since I was a child, I must admit that I haven’t bought very many of their products during my lifetime. However, I found these two beauties a week or two ago and I thought that this would be a great time to do a review! These two eyeshadows are single color compacts that come in a rather interesting shape. Each square compact opens from the back and has a separate plastic piece inside. This piece keeps the pressed powder from falling into the lid and becoming a loose powder. While I don’t typically wear pink eyeshadow, this color was absolutely to die for. L’Oreal has dubbed it their Pink Sapphire pressed eyeshadow. I feel that this name makes the color seem more hot pink than it really is. I see this shade as a vintage rose color with flecks of gold in a Victorian -esque era. 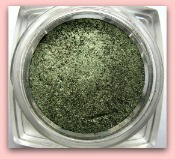 This green Loreal eye shadow is an interesting and beautiful color. It is more of a forest color than olive, but certainly doesn’t have a gaudy jungle green tinge to it. It is the perfect mix between true deep green and a slightly earthier seaweed green. Of course, the shimmer in every eyeshadow of L’Oreals Infallible series makes the colors stand out even more, giving them an almost diamond like sheen while still falling short of glitter status. I found that I also liked the texture of these shadows as the brush picked them up. Some eyeshadows don’t stick to the brush well and can make layering the color difficult. These eyeshadows are pressed powder, so you can adjust how much makeup to pick up by the weight you place on the brush. Both of these also passed the damp brush test. Cheaper eyeshadows will simply become diluted and cakey when you apply them using a wet brush. The Pink Sapphire and Golden Sage stayed just as dense and shimmery while wet, even becoming darker to create that slick, shiny look. Overall, I have been very happy with both of these Loreal eye shadow compacts. At about $8 each, the price was definitely right and the product was worthwhile. I only want to find out if they have some other great colors I might be missing out on!